Our house renovation is coming along, albeit more slowly than we’d hoped. We’ve had such a busy August and September with our clients’ projects, we’ve hardly had time to attend to our own: our ongoing house renewal and renovation. After stripping the house to its bare essentials (structure really, and not much else) we’ve spent the summer reframing and altering the building to its new configuration. Then came the windows, the plumbing and electrical rough-ins, now substantially done. So now we head into insulating and vapour barriers. That’s why whole parts of the house are now grape purple. 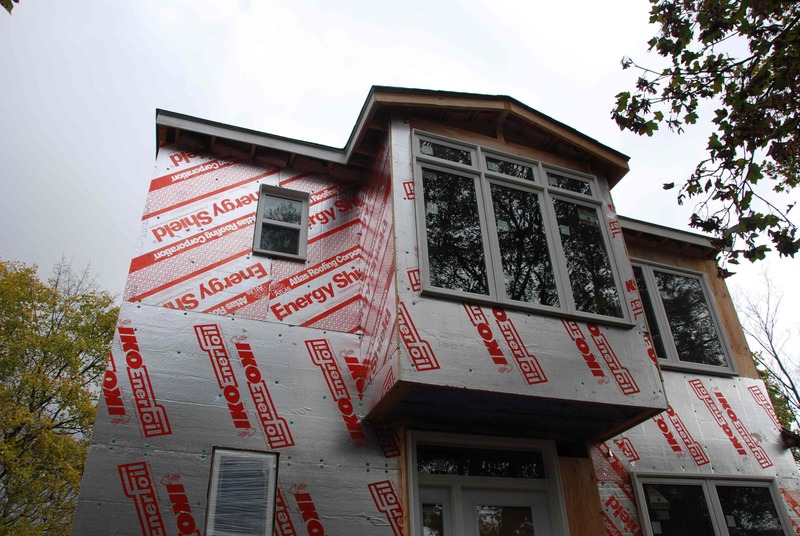 This post is about the decisions we’ve made regarding sealing and insulating the house. There’s a whole variety of issues and interrelated aspects to that, so I’ll try to set them out. First of all, we’ve got the climate to assess. Kitchener swings from over 30 degrees celsius in the height of summer to the occasional -20 winter day, with a fairly long winter heating season. The bill for heating the house is going to depend a lot on what we do under its steeply pitched roof, and how we handle sealing up the house. One of our big design decisions was to use as much space in the small house as possible, as wisely as possible. That meant finishing the basement with some amenity, and turning the steep pitched roof areas of the second floor into a rear addition and a front set of closets and storage. that meant basement insulation and finishing, and lots of cathedral ceiling. 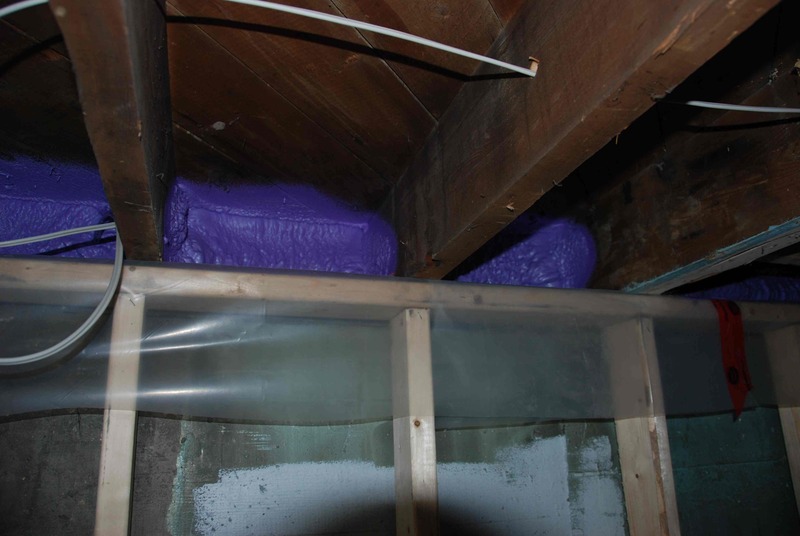 Both situations mean careful attention to sealing and insulating are a necessity. In order to ensure fuller and complete insulation, and to meet wall insulating standards while using the existing 2 by 4 walls, we removed all the old siding (both the aluminum and the older wood siding) and have sheathed the entire outside of the walls with 3/4 of an inch of isocyanurate sheathing board. We’ve taped all the joints (that’s that red tape in the photos) to create an air barrier, and we’ll be sealing any holes in this first layer of insulation (around windows and doors, for instance) to create a good start to our envelope. Energy gains and losses in buildings work on the basis of radiation (direct rays of radiation from hotter masses to colder masses), convection (air movement conveying the energy) and conduction (the slow, or not so slow, passage of heat along a path from hot to cold). The reflective silvered skins on our exterior layer of insulating sheathing help to reflect radiation back onto its source. It keeps the hot surfaces and cold surfaces apart, so that’s how we help close the radiation path. Then, we seal the building as best we can, using a combination of spray insulation and plastic vapour barrier. That’s critical, because our house is much like a hot air balloon. Since hot air rises, the winter months create a situation where the top of the house is pressurized relative to the colder exterior environment. If we allow air to escape from this envelope at the top, and enter in the basement at the bottom, we create a conveyor of energy from inside to out. That’s how old leaky houses work (and new, poorly built ones). Worse still, that warm air contains more water vapour. When the air escapes the house envelope, it cools. With the change in temperature, it has to condense some of that vapour into water (because cooler air can’t hold as much moisture). This leads to ice buildup in the upper walls and roof assemblies. That leads to damage, and even worse thermal performance. Its not a good situation. 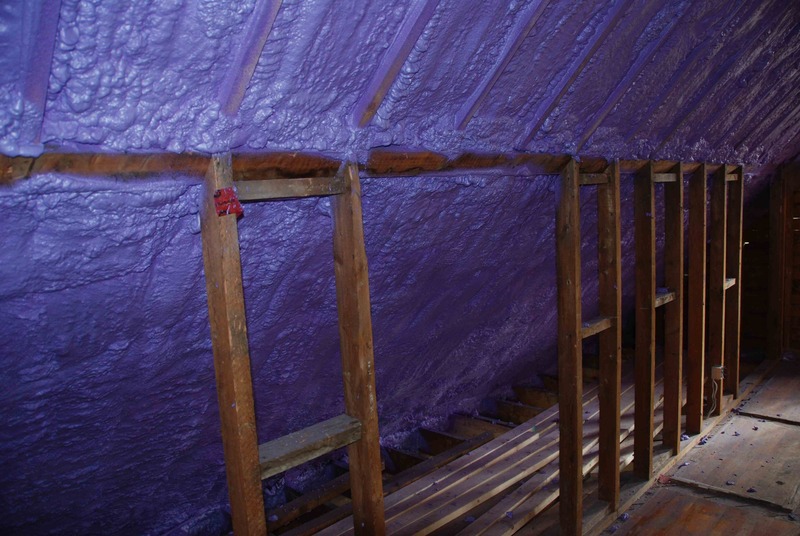 So the vapour and air barriers are key, and that’s one of the reasons why we decided to turn the house purple. Well, not really purple. It’s just that the spray urethane insulation we’ve had applied comes in that colour (at lease the BASF product does). Because we’ve got so much cathedral ceiling to apply to existing rafters, the choice of spray insulation, with its complete seal and high insulating value, was a relatively easy one. It’s more expensive than traditional fibreglas batt and plastic vapour barrier, but we can get the insulating value we need in only 5 inches or so (at R-7 per inch) rather than the 10 inches that would be needed with batts. That means more space in our second floor for living. Before spraying the underside of our roof, we install continuous vent forms between the rafters. These connect the eaves and the ridge attic, allowing air to flow just under the shingles (but outside the insulated and sealed envelope). This keeps the shingles cooler in summer, to protect against shingle curl. Once the decision was made to spray (and in fact part of that assessment) we got a great bonus. We were able to spray the top of the foundation wall and ground floor framing, and the second floor intersection, to stop air transfer at the house perimeter. With positive pressure to the top of the house (from that hot air rises thing) comes negative pressure in the basement. To stop the ingress of air from that negative pressure, spray insulation is a great choice. For older houses, even better. So we’re in the middle of the insulating exercise, but well on our way to a well-sealed, well-insulated envelope that will pay big dividends down the road. More comfort, and lower utility bills. A bit of trouble and expense, but really it’s a win-win. This entry was posted in building science, Environment and tagged design, house renovation, insulating, sustainability on 2011/10/23 by adminjma.